Buried somewhere in the membership pages on the web sites of many small art museums and cultural centers in the U.S. and Canada, usually somewhere halfway down the page of museum membership levels, is a little perk that can sometimes make a higher level museum membership into a great deal. 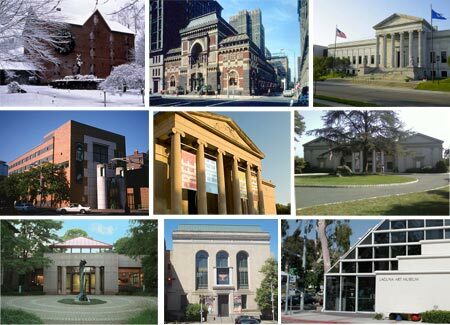 Over 300 smaller, “regional” museums, most of them art museums or similar cultural institutions, have made agreements to offer reciprocal membership privileges to the members of other participating museums through the North American Reciprocal Museum Program (NARM). If, like me, you’re an inveterate museum goer, and if, like me, you’ve discovered the treasures to be found in small regional art museums in the U.S., this can be a terrific deal, particularly if the museum you get your membership from does not ask for too high a membership level for access to the reciprocal agreement status. There is a list of participating museums here, that is linked to the sites of the museums. You can find a museum you might be inclined to join and check out their membership pages for details on their required membership level for the “perk” of the NARM sticker on your membership card. You don’t have to join a museum in your area, most museums will gladly accept members from other states (particularly these days), and the price of the membership level varies widely. Some ask over $300, others considerably less. Each museum also usually has a brief description of the program and it’s benefits (and also usually offer additional membership benefits at the level required). Many of them offer a downloadable PDF of the participating museum list. The best deal I’ve found is at the Brandywine River Museum in Chadds Ford, Pa, a museum I’m inclined to be a member of anyway. They only ask for a $100 “Donor Level” membership to get the NARM sticker added to your membership card. You can look over the list of participating museums, calculate how often you’re likely to visit some of them, and see if the cost is worth it. For me it pays for itself a couple of times over, as there are a number of museums that I visit in Pennsylvania, New Jersey, Maryland and New York that are on the list. If you’re in an area where travel to other regional museums is more difficult, it may not be as viable. The reciprocal membership includes basic membership admission and gift shop discount privileges at the participating museums. You may want to check the notes at the bottom of the list, however, as there are a few restrictions between certain museums (usually in the same area). I like museum memberships anyway. They not only help support the museums and give you benefits like members’ previews and bookstore discounts, but they give you a sense of freedom about visiting frequently and dropping in on a whim, without reservations about spending enough time to make the cost of admission worthwhile. Add to that the impetus to explore other museums on the list that are within reach or available when you travel, and you have a terrific bit of inspiration in your pocket in the form of the NARM sticker on your museum membership card. 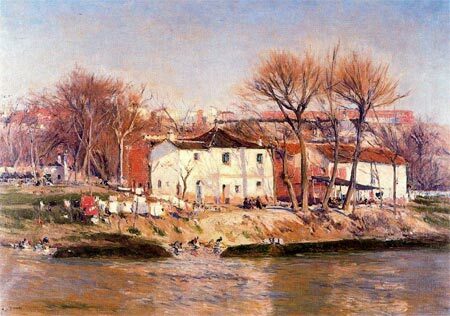 Aureliano de Beruete y Moret was a Spanish painter active in the late 19th and early 20th centuries. He was born in Madrid and spent most of his life there, though he traveled widely. Beruete started out to be a lawyer, earned his doctorate, but at the same time studied painting with Carlos Múgica. He initially embarked on a career as a politician and became a member of of Parliment, not a career normally thought of as a cross over with painting (Winston Churchill notwithstanding), but eventually choose the artistic path and studied with Martin Rico and Carlos de Haes at Academia de Bellas Artes de San Fernando in Madrid. They both undoubtedly had an impact on their student Beruete, who became one of the most significant Spanish exponents of the Impressionist characteristics of open brushwork and location landscape painting. His palette was a bit darker, however, and he always showed the influence of great Spanish masters of the past, including Diego Velázquez, about whom he assembled the first catalogue raisonné. Beruete was friends with the amazing painter Joaquín Sorolla y Bastida (who painted a portrait of Beruet), though he never fully adopted his friend’s brighter palette. Both get labeled as “Spanish Impressionists”, but neither were adherents of the French painters’ theories, nor did they feel compelled to abandon academic traditions as did their French counterparts. I associate them more with the painters who get labeled “American Impressionists”, who also adopted elements of the Impressionist style, but maintained their own independent vision and the solid underpinnings of academic realism. Beruete is not well known to Americans (I just discovered his work recently), and it’s a real treat when you first discover his beautifully loose, confident brushwork, rich textures and sweeping compositions. If that seems odd, you may not be aware that many comic book overs are painted (a practice that has a fairly long history) and, in recent years, an increasing number of comics stories themselves are being told in fully rendered painted panels. I trace fully painted comic stories back to the pioneering work of Will Elder on Little Annie Fanny in the 1960’s, though perhaps there were antecedents in European comics I’m not aware of. The limiting factor in mainstream American comic books was printing technology. For a long time comics were printed by letterpress (like newspapers), and color was applied by hand-cutting stencils. That has changed dramatically, of course, and in modern comic book printing almost anything is possible; and the main limitation on painted comic book stories is that the process can be even more work and time intensive than traditional ink outline with filled colors. Some purists don’t like the painted approach, feeling that it’s not “comics” unless it’s black line art with color fills, but I think it works fine as long as the artist has good visual storytelling skills. Though within the practice of painted comics stories artists can take a variety of approaches, and in the hands of some artists it can feel forced and stiff, with the visual weight of the fully painted images slowing down the pace of the story. Rivera, I think, is an artist who has a light and varied touch to his painted interior panels, and a natural feel for this variation on the comics medium. He has an approach that flows with the story, propelling it rather than slowing it down, and providing a wonderful textural quality to the images that only painted panels can provide. Rivera grew up around art, his parents owned an art supply store, and he started working for Marvel comics while still a junior at the Rhode Island School of Design. He found his calling in comics, particularly painted comics, when he was struck by the painted comics work of Alex Ross on Marvels. Rivera has become well known as a painted cover artist and for his painted storytelling work on a series called Mythos as well as titles like Spectacular Spider-Man. Lately he has been showing himself to be adept at the traditional line art style of comic storytelling, tough I hope it doesn’t mean we’ll see a lot less of his painted work. 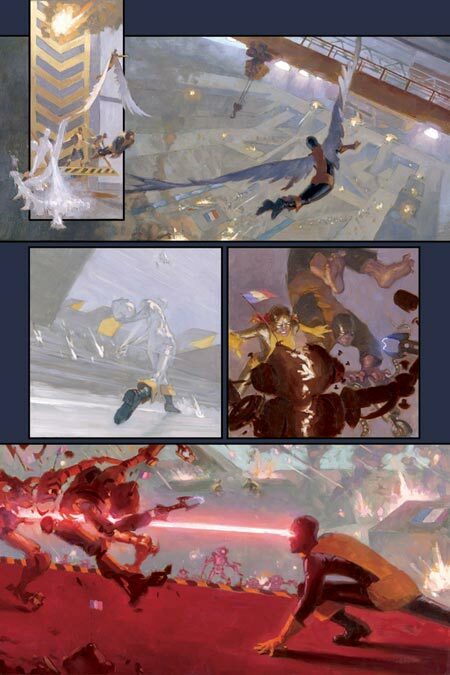 As part of the lead-up to the New York Comic Con, coming up February 6th – 8th, where Rivera will be among the guest artists, he is giving a lecture on Comics, Color and Composition at the Brooklyn Public Library on Wednesday, February 4th, 2009. The lecture will be at 7pm in the Dweck Center of the Central Library on Grand Army Plaza. It’s free and open to the public and will be followed by a question and answer session, so comic-artists-to-be can grill him on his drawing and painting techniques. 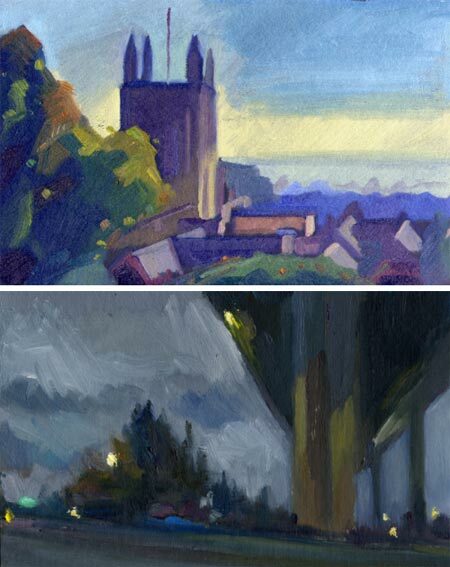 I first came across Antony Bridge in the form of his time-lapse YouTube videos about pochade painting, when I was doing research on pochade boxes. 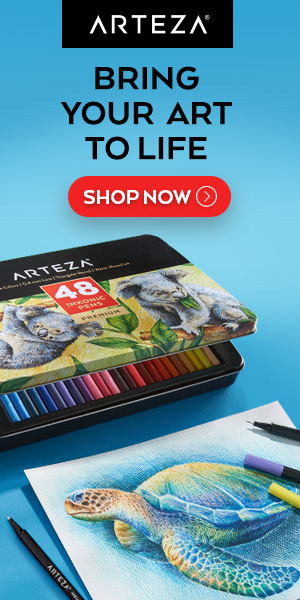 In them you can see Antony painting at various locations in the English countryside and towns, using his small hand-held pochade box, as well as painting small self portraits. I followed links to the site at pochade.co.uk where he displays and sells his paintings with other pochade artists like Carl Melegari and Ben Spurling, interviews artists who do pochade painting, (including Carol Marine, who I wrote about here), shares a blog with other painters on the site, and also sells the small hand-held pochade boxes he uses. These are made on a small scale basis by a UK carpenter and designer who works under the name of Red Top designs. Antony Bridge (image above, top) studied illustration and, when not pochade painting, works as a freelance designer creating title sequences for TV productions as well as doing event branding. His pochade paintings range from hillsides and town scenes to still life and interiors. He also has a series of self portrait studies. Ben Spurling (image above, bottom) was also trained in illustration. His painting subjects lean toward coastlines, mountains and dramatic skies, in addition to smaller scale subjects and still life. Independent filmmaker Wayne Alan Harold, who has done segments for MTV News, and underground films like Killer Nerd, Bride of Killer Nerd, Girlfriends and Townies, recently launched an online video network called Lurid.com (a great name). 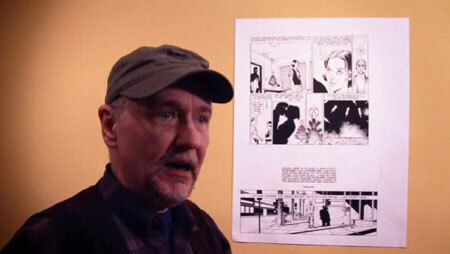 One of the leading items on the site is a series called PCR TV, featuring short segments, not quite interviews, more like expositions, by P. Craig Russell, the veteran comics artist who I mentioned in my recent post about his graphic adaptation of Neil Gaiman’s Coraline, as well as in one of the earliest posts on Lines and Colors back in 2005. In the segments, Russell talks about various aspects of graphic stroytelling. Subjects in the four videos so far include Introductions, for which he uses as reference his work on graphic adaptations of Pelléas & Mélisande and Salmoe; and Parallel Narrative, for which he makes reference to his adaptation of Gaiman’s Murder Mysteries. They are instructional both for comics artists and anyone interested in the craft and techniques of graphic storytelling. The idea for the feature is a spin off of Harold’s recently completed documentary, Night Music: The Art of P. Craig Russell (Amazon link here). The segments are being added to once a week. I don’t know how many there will be. In the 1950’s 60’s and 70’s, a number of non-animated television shows had animated titles, something that was also common in movies of the time. Undoubtedly influenced by the film title mini-masterpieces of Saul Bass, the TV titles were usually much cruder and less imaginative, but still amusing nonetheless. and, of course, Terry Gilliam’s wonderfully loony animated collage titles for Monty Python’s Flying Circus, of which there were several versions (bottom). Fanboy.com has posted a nice article with some examples of these and others, titled The Golden Age of Animated TV Opening Titles. Some of them are a little over-compressed and you may be able to find better copies by cruising YouTube and the other video aggregation sites, I don’t know. While you’re thinking about animated titles, it’s always worth a stop by the Submarine Channel’s Forget the Film, Watch the Titles, to see what delights have been added to their selection of movie titles (see my posts on Forget the Film, Watch the Titles).